Highly recommended restaurant – The Best Restaurants in Hoi An. Searching for a restaurant in Hoi An old town for breakfast, lunch, dinner, visitors can be overloaded by information meltdown. Can be said that Hoi An is abundant of food court, food stalls and restaurants from the basic class to high end level. We will wander in Hoi An to try all cuisines of the ancient town. Let’s prepare for an empty stomach and design a detail plan for a food tour. First we will search for individual dishes which are standing out of Hoi An. One of the most signature cuisine of Hoi An is “Cao lau”, a special kind of noodles-liked dish. It can be said for sure that everyone comes to Hoi An has heard about Cao lau and most people are eager to taste Cao Lau. It is easy to find Cao lau everywhere, from luxurious restaurants to food courts around market. There are some suggestions for tourists to get Cao lau for the first meal in Hoi An. – Cao lau Ba Be: This is a food court of a woman named Be in the Hoi An central market in the intersection at the corner of Tran Phu street, opposite to Ong pagoda. Its taste is really “local” from the flavor of noodles to the stools to sit on. 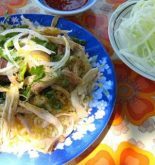 – “Thanh Cao lau” at 26 Thai Phien: a very small and simple food stall takes a special taste in a bowl of Cao lau. A full of noodles bowl with carefully prepared ingredients implies the hospitality of the host. Moreover, this restaurant is favorite place of local people for breakfast. Having a bowl of Cao lau in a place surrounded by local atmosphere is the best way to enjoy the lifestyle of Hoi An people. Eating a traditional Hoi An cuisine in an ancient town costs you about one dollar, which is reasonable price for almost backpackers. It is right that “banh mi” can be found everywhere in Vietnam. But if you try “banh mi Hoi An”, you will not have to regret eating the loaf of bread. On Tripadvisor, “Banh mi Phuong”- a 4.4 star bread shop located in the entrance of Hoang Dieu St, is well-known “banh mi” food stall for both quality and price. Customers have to queue in long line to get a multiple-ingredient “banh mi”. Occasionally, people order many loaves to take home. However, not many people can’t stand waiting until getting home but start to bite the loaf to enjoy the crumbly bread with fresh ingredients and super special sauces. More attractively, a yummy healthy street food costs only one dollar, which can drive eaters to order some more loaves for biting while walking around. The cuisine is named after the province, which shows the confirmation of a specialty. Quang noodles can be found wherever, however, it should be tried by the specialized food stalls. Quang noodles is extremely a local food for middle class in society, therefore, the price is affordable. Let’s your stomach empty, you will occasionally meet a street vendor on pavement that can offer you the flavored Quang noodles bowl. Now if you really have a big stomach for trying some cuisines in a meal, the list below can be useful for you to save time. If you read the legend about the secret of Cao lau, you must be interested in the name “Bale Well”. Bale Well Restaurant is located near Bale lane on the edge of Hoi An’s old town. This is a familiar restaurant to the local people is highly recommended by them. Bale Well is actually not much more than a street food stall with a bench table and some plastic chairs. The difference of the restaurant is no menu. There is only one menu posted on the advertising sign. When visitors get to Bale Well, the plates with fresh herbs and crispy pancakes stuffed with shrimp, pork and sprouts, grilled pork satay, spring rolls and grill pork with salad and rice paper are displayed in front of you like a picture of foods. It is a must- visit place for you and you had better to remember to bring your hungry stomach. Moreover, the restaurant also offers cooking class. The owner, also the fabulous teacher will show you how to make a magic “banh xeo” (Vietnamese pancake) that you can’t stand waiting but bite it as soon as possible. Located on 12 Le Loi St, Hoi An, The Little Menu is not only a restaurant but a cooking class. The restaurant offers from the local Vietnamese food such as banana blossom salad with grilled chicken, Quang noodles to more Western food like white tuna steak and desserts. The featuring of The Little Menu is cooking class. The teacher, Mr. Phap, is a hospital host and incredible. He enthusiastically guides learners how to choose the best ingredients from the local market, and then how to make the unbelievable delicious dishes. Most people are satisfied with his welcoming attitude and moreover, they are satisfied with themselves because of the fantastic food made by them. The Morning Glory restaurant is one of the well-known restaurants in Hoi An. The restaurant is located on the formed colony house on 106 Nguyen Thai Hoc St. The menu is diversified from authentic Vietnamese food to luxurious western cuisines. Whatever you choose, you are served at high end class style by friendly professional waiters. Each dish displayed on table in front of you has been made by talented hands of chef. It is not only fabulous flavor but complicate in cooking and decorating. Though the price could be higher than other restaurant, it is reasonable price for visitors to having meal in a comfortable place. A tip for customer before getting to the Morning glory is book table in advance because the restaurant is full of eaters. In addition, cooking class is introduced to help food lovers learn the secret of delicious Vietnamese specialties. We do not say for sure those above restaurants and food courts are the best restaurants in Hoi An. However, it is you who have right to rank the position of food place. Before that, getting a plan to try and become a fair judge. Dare you?